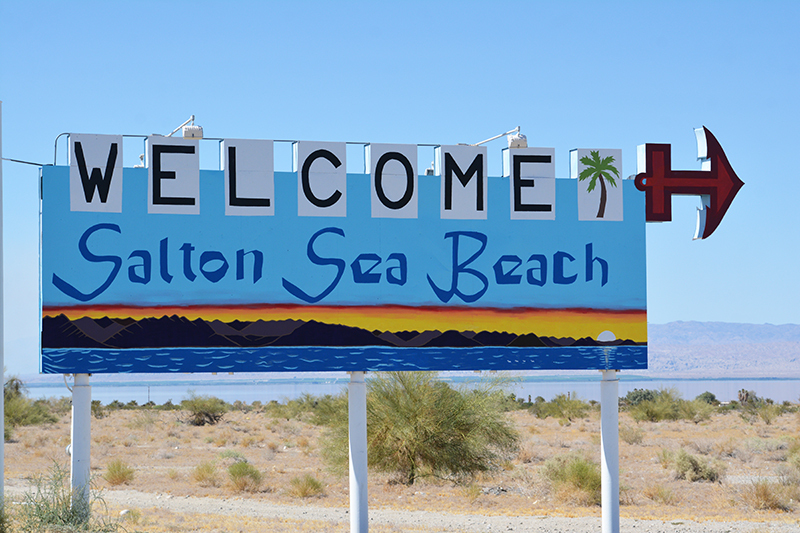 Driving on Highway 86 through Salton City, it looked like any other town, complete with homes, gas stations, restaurants, stores, and even a nice sized casino. 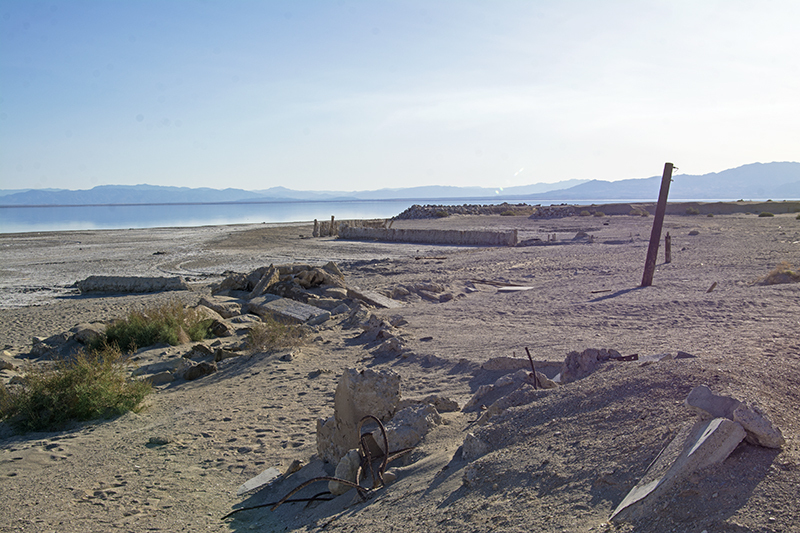 Beyond the city sits the real interest and curiosity, the mystery of the Salton Sea. In the distance you can see the lake with its pretty blue tint. Devoid of any wind on this hot May afternoon it was smooth as silk, not a ripple on the surface. 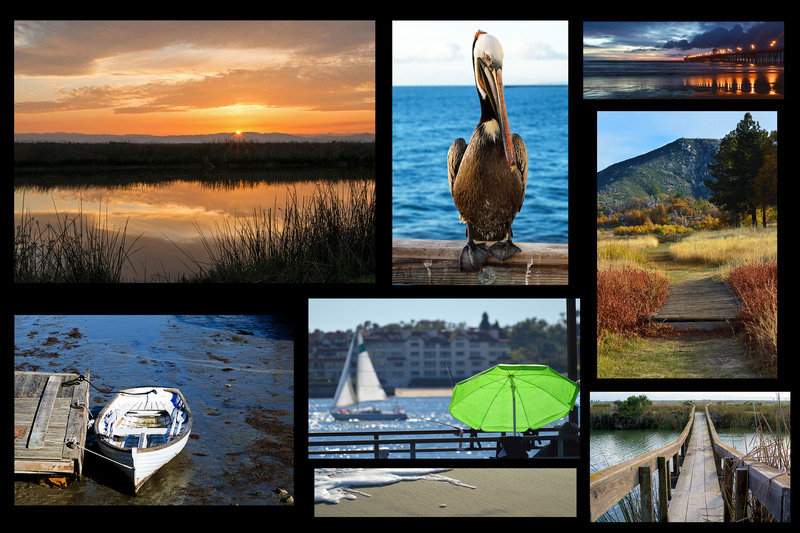 Noticeably missing was something that you’ll find on most desert lakes this time of year…boats, personal watercraft, water-skiers, and people! Not one boat was out on the lake! 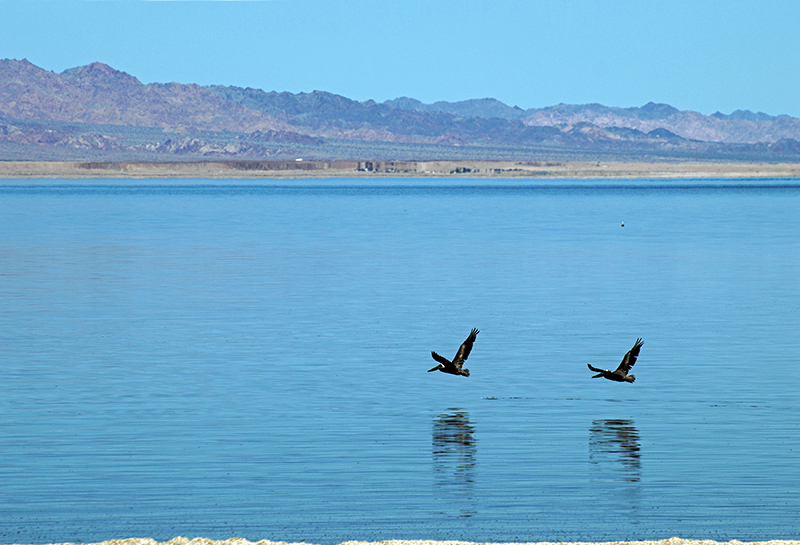 Granted, it was 105 degrees outside but that was more the reason to be out on the water! Looking at this vast lake you could see the shore from side to side but, length-wise, it was hard to make out where it ended. It was huge! From the middle of one side to drive to the exact same spot on the other side would take at least an hour. We know, because that is exactly what we did. 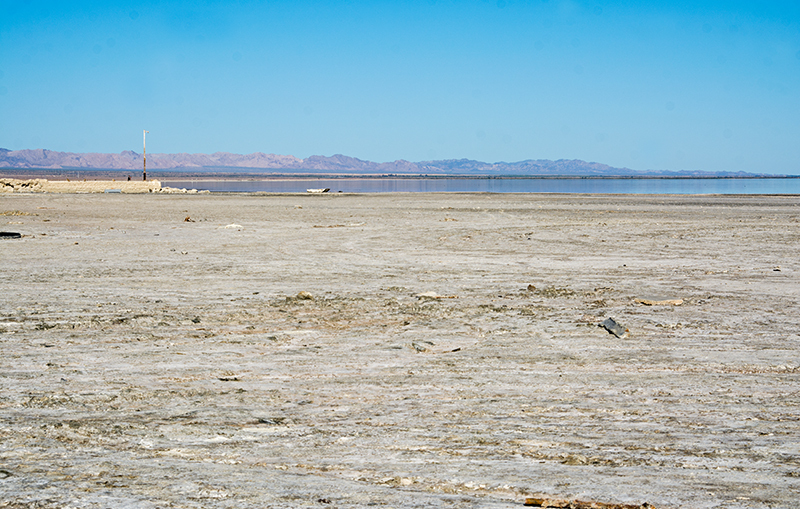 As we made our way to the shore to investigate the Salton Sea, it occurred to me that this is the type of place you need to explore with a vivid imagination. You have to be able to reach down and envision what this place must have been like in the 1950’s and 1960’s. It is not a staycation or day trip that is for everybody. 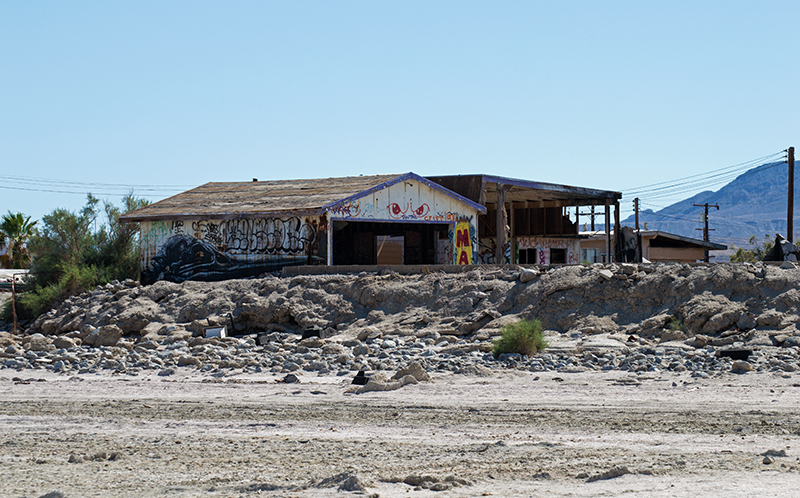 Standing on the sand at the once popular Bombay Beach, I closed my eyes and imagined the sounds and sights of the era that made this one of the most popular resorts in its time. It is said to have had more visitors per year than Yosemite. Eyes closed, I heard the sounds of speed boats soaring by with joyful water-skiers propped up on two skis, gliding high on the water with smiles on their faces. In the distance, kids’ laughter filled the beach, 60’s tunes played on radios, and the sweet smell of Coppertone sun tan lotion filled the nostrils. Now with eyes opened, it is back to 2017 and it is dead quiet. No speed boats, no laughter, no music, not a sound. The smell of sun tan lotion is now replaced with a faint yet noticeable scent of salt and dead fish. As I walked along the empty beach, the sand wasn’t really sand although it probably was back then. It was skeletons of fish parts. 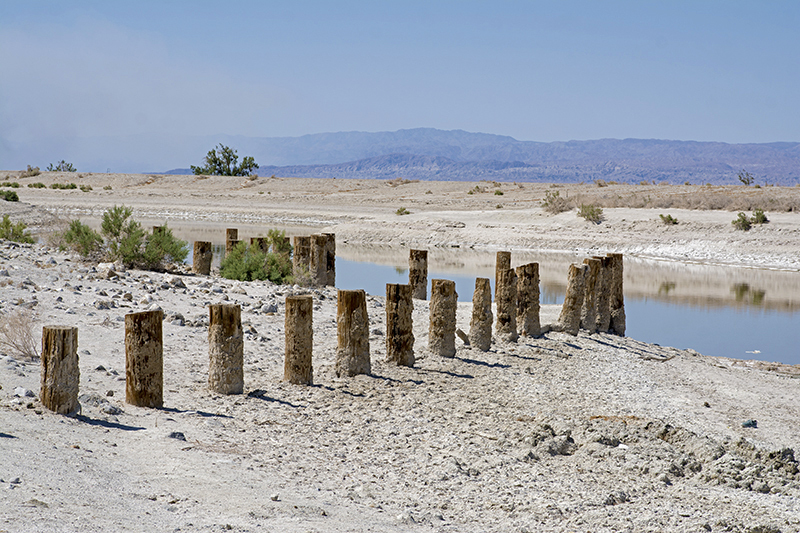 So what happened to the Salton Sea? 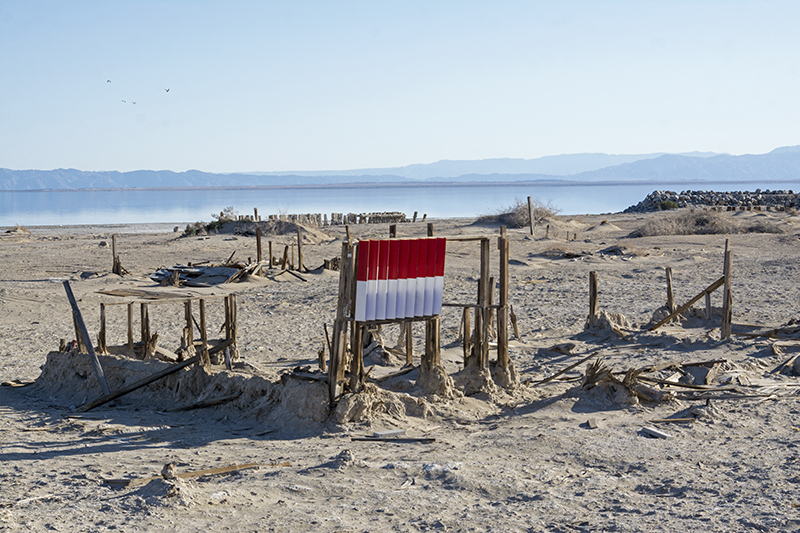 It is documented that Salton Sea was formed in 1909 following extreme rains that flooded the Colorado River and blew out a weak irrigation channel. 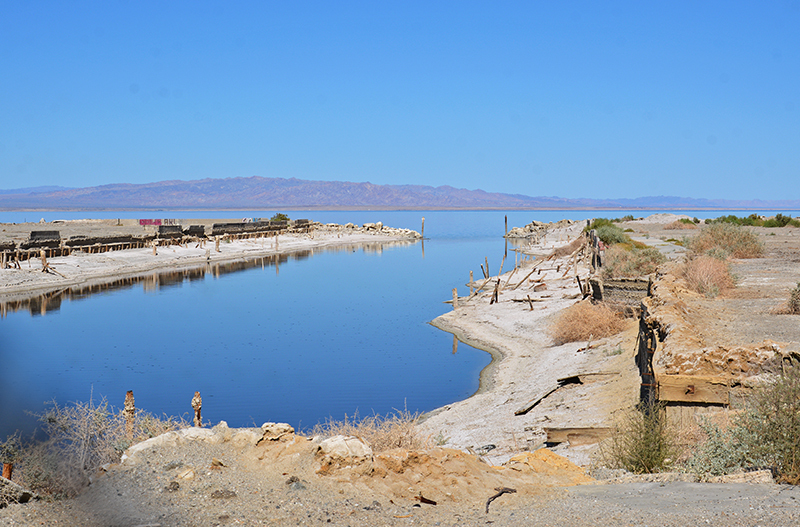 A lower area now known as the Salton Sea was sitting below sea level at 235 feet and soon filled with water continually for at least two years until the breach was finally fixed. A new fresh water lake was now formed and it was not small! 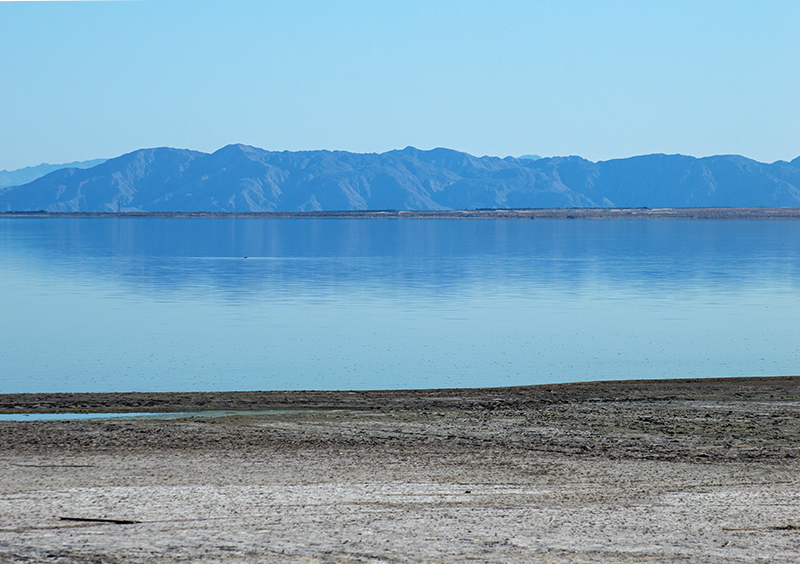 It spans 34 miles long and 14 miles wide, by comparison Lake Tahoe is 21 miles long by 11 miles wide. 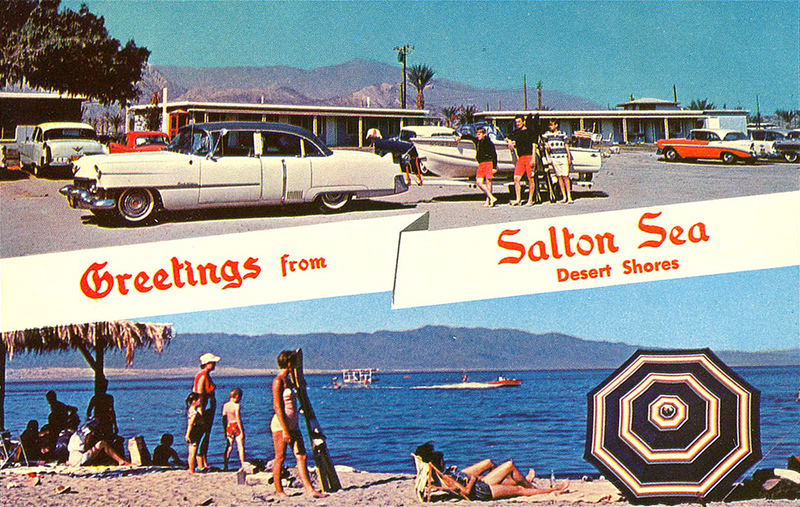 In the 1950’s the city of Palm Springs was a popular destination and developers saw the nearby Salton Sea as an opportunity to bring people to this beautiful waterfront oasis. Soon, it had resorts, hotels, spas, boat ramps, marinas, yacht clubs, and celebrities. 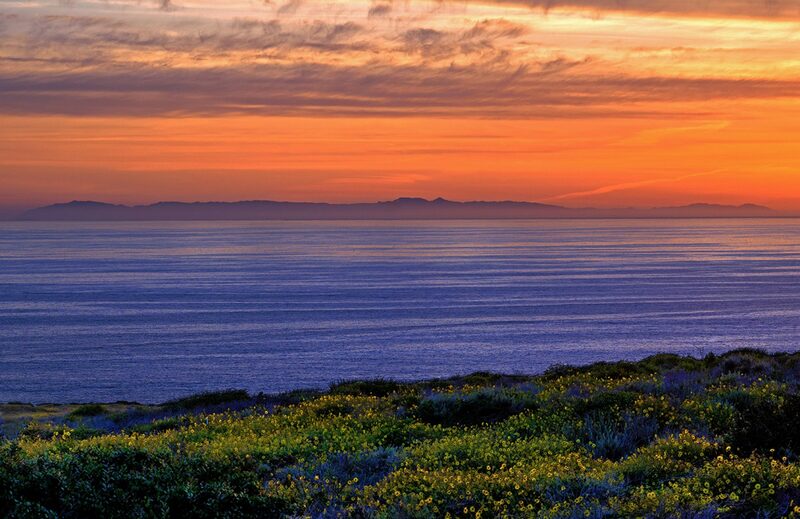 It became a popular spot of the Hollywood elite with notables like Frank Sinatra flocking to the area for fun under the sun and on the water! Fish were soon introduced to the lake, bringing in sport fisherman and by the late 1950’s it was drawing over 1.5 million visitors annually. It was a flourishing vacation spot with boat regattas, festivals, night clubs, and plenty of celebrity sightings. 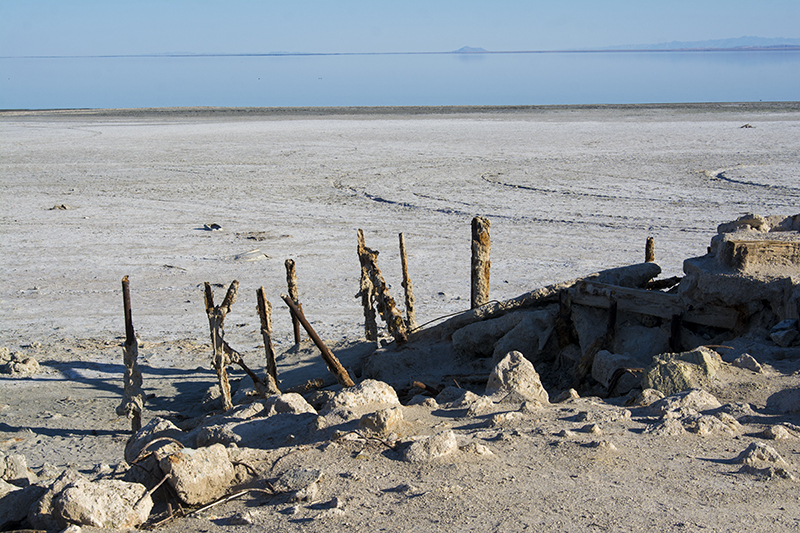 Through the 1960’s it thrived, however, later in that decade it started gaining salt content from soil run-off from the nearby agricultural farms. 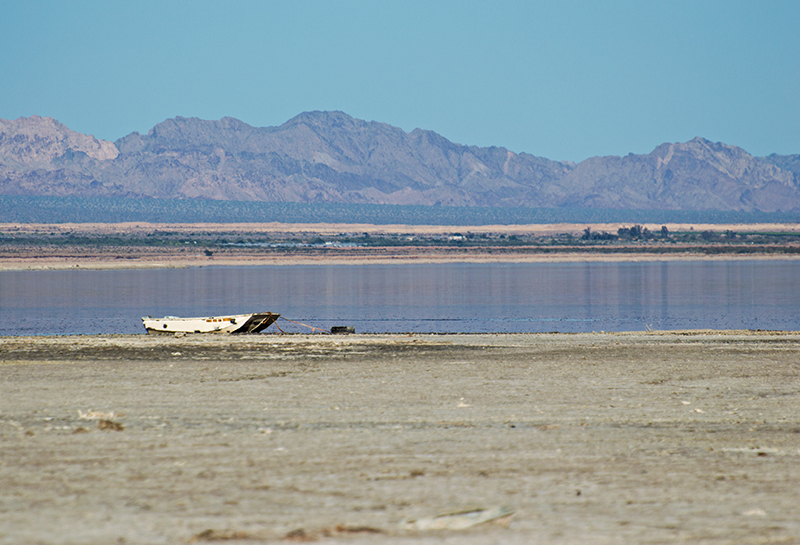 By the late 1970’s, with not much rainfall and no drainage outlet, the lake was becoming polluted with the pesticides from that run-off and the salt from the agricultural soil. The salt content started killing off the fresh water fish, so salt water fish were introduced and flourished for awhile. 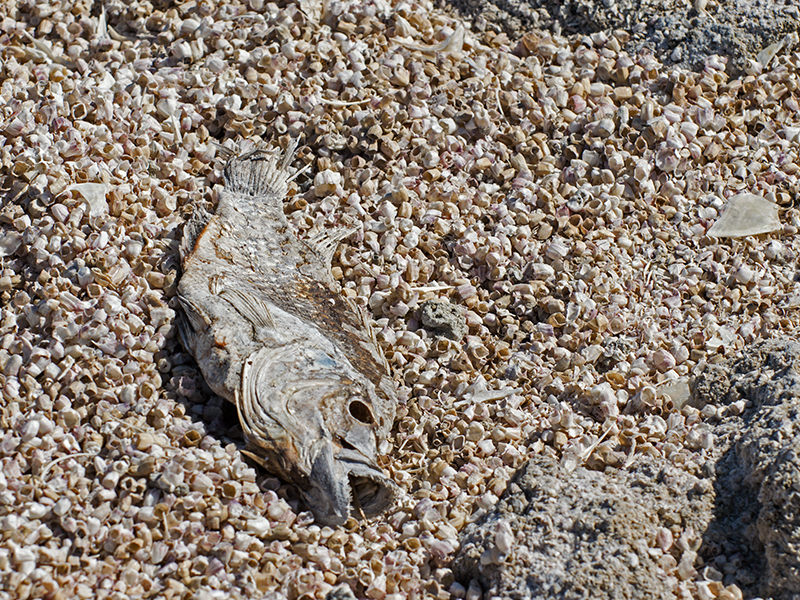 But the salinity proved too much and only the hardiest of the salt water fish survived. The water soon took on the smell of rotting fish and algae. Unfortunately, the visitors and celebrities stopped coming. Add to the whole mess, a few tropical storms in the 1970’s caused devastating flooding and destroyed some of the businesses beyond repair. 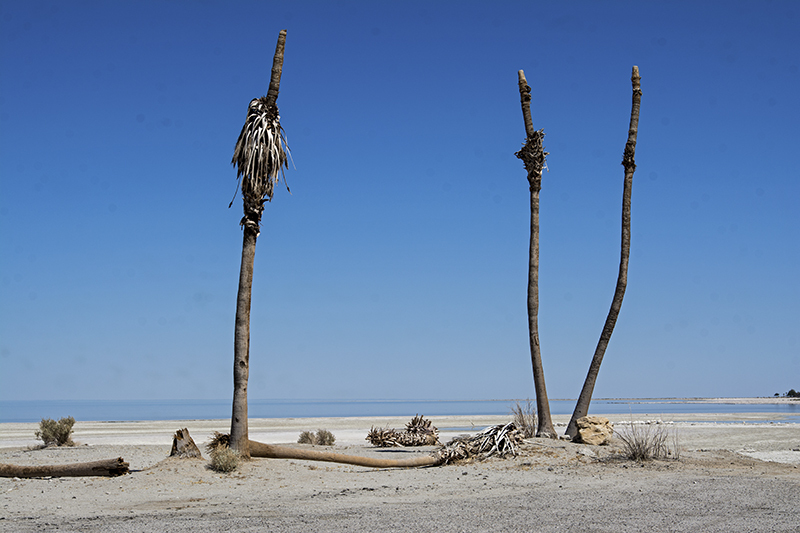 Over the course of many years, the area died a slow death and today along the shore, only the skeletons of the past can be found. 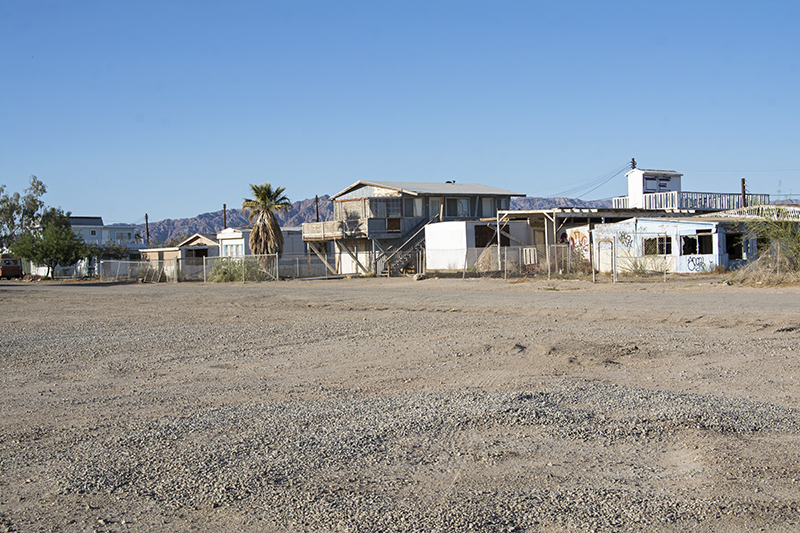 They call this area an apocalyptic town, at least down by the lake. 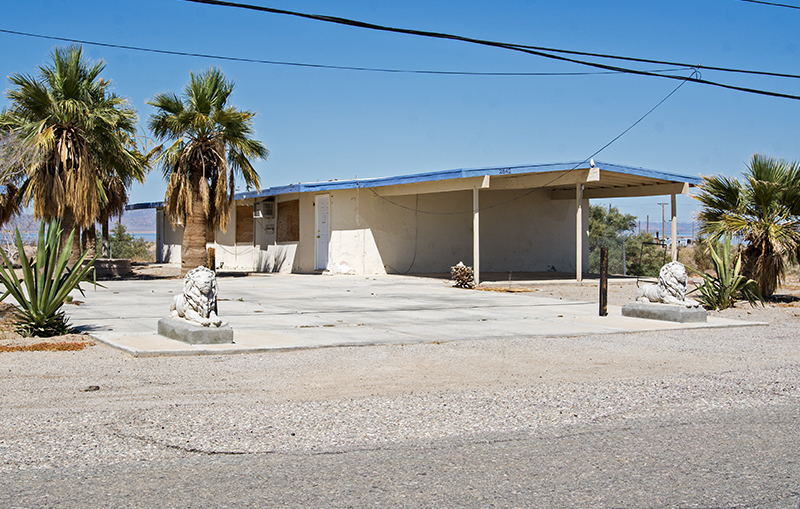 The abandoned shells of buildings, hotels, spas, parking lots, and public bathrooms can be seen where a beach or marina once thrived. You do get the feeling of being the last few people on earth as you walk around the deserted shore front with not another soul around. Every once in a while another looky-loo comes by to snap some photos but other than that it is dead quiet. I sometimes like to talk to locals to get their feel and their take on the area but there was no one walking around, no one walking their dog on the beach, no one riding a bike. Granted, the air temperature was over 100 degrees and residents that are still living there were probably sitting by their air conditioners nice and cool. Not like us foolish tourists walking around in the heat, day-dreaming about a time long gone. 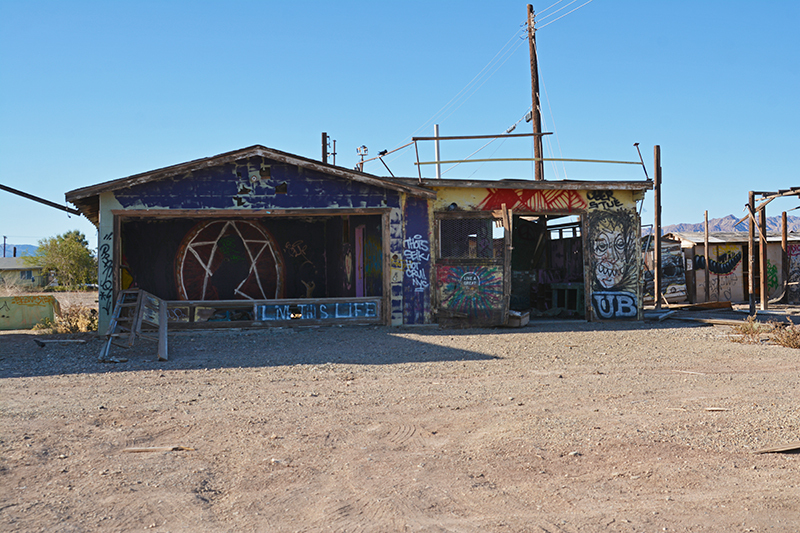 At Bombay Beach the neighborhoods were deserted and the homes were empty and deteriorated. 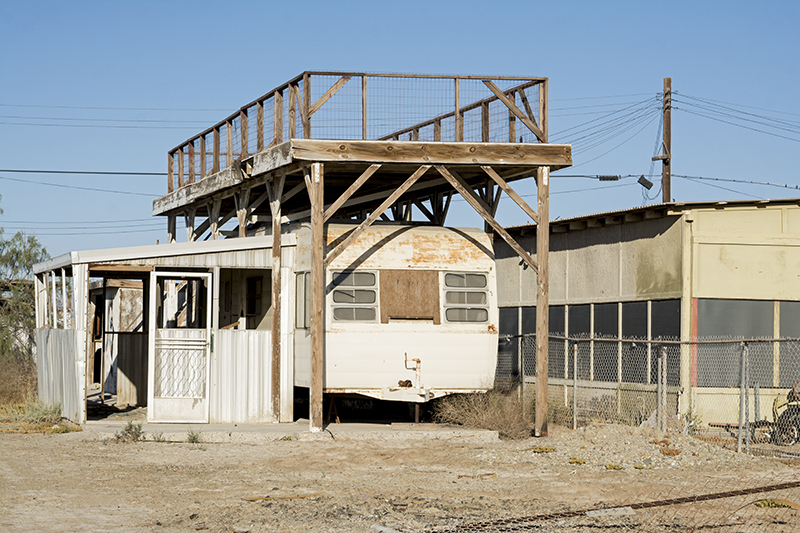 Yet once in a while you could see a place where people WERE living. A car out front or a satellite dish on the roof was our only signs that there was life. 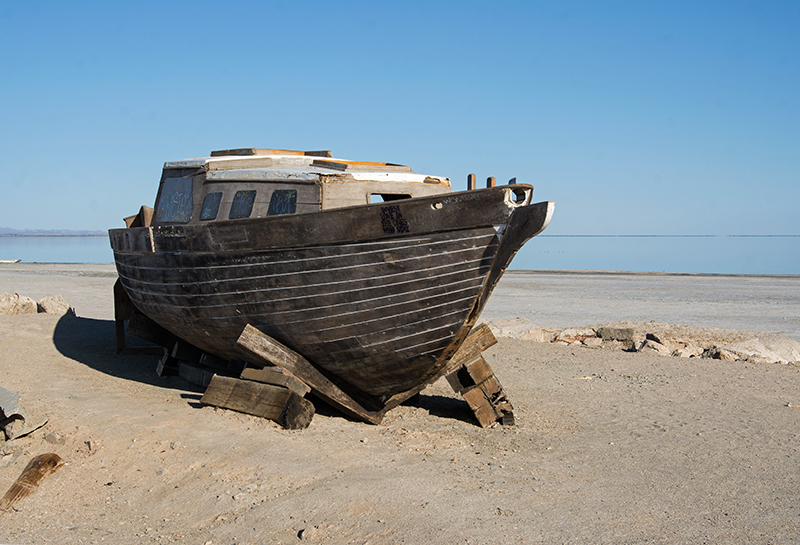 Everything was abandoned down by the shore. Far on the other side of the lake we discovered the remains of what was once a marina. A huge parking lot with nearly dead palm trees looked out to an expansive beach that was probably once filled with tons of people. Down the way, a broken down exterior of public bathrooms were filled with wall to wall graffiti and the only actual resident I saw, popped his head over the wall and said hello as if I was an old friend stopping by. It startled me. I said hi back and then was on my way. There wasn’t supposed to be anyone else on earth in my daydream, remember? Marina entrance where movies stars kept their boats. On one beach I walked to the shore to see what the water looked like. The stench of rotting fish hadn’t gotten too strong yet but it was ever present and I only saw a few dead fish along the way. It wasn’t the type of beach I would like to sit on all day and the water didn’t look too inviting either on close inspection. Pieces of algae and other plant like stuff sat right at the edge and it just looked…yucky. Sorry, I couldn’t come up with a better description, yucky seems to fit. Upon further research I heard they have opened up a boat launch and are encouraging boaters back out on the water. There are still some fish in the lake although I don’t think anything is cleared to be consumed by humans. Kayakers are coming out a little more, and a Waterfowl Preserve is close by which would appeal to bird watchers. It is just the swimming part that I would be unsure about. In the 1970’s, I was lucky enough to water-ski there and I remember the water being warm and clean. I was once one of those smiling water-skiers out for a fun day on the lake. 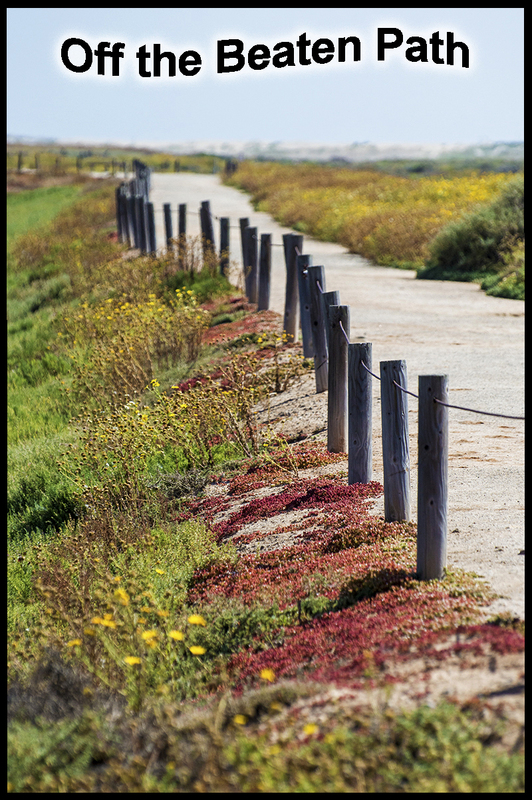 As the sea continues to recede, there are plans in place to build ponds, create wetlands, and to preserve the oasis for migrating birds. The dry areas could present a health hazard as the winds take the toxic dust airborne into an area that already has the highest asthma rate in the state. I will keep an eye out for that progress. I hope they can do something to help its sad deterioration. 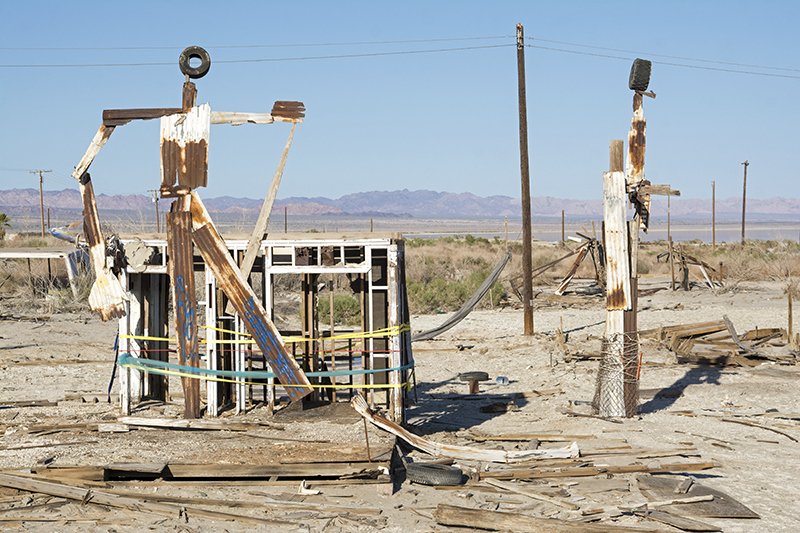 What a shame to see the demise of this once great playground in the desert. As it gets really hot in the summer, be sure and bring some water, a camera, a friend, and most importantly… your imagination.